Historically, Atlassian Jira was built for the technical corner of workplaces. The system was originally developed for software teams, and even today it focuses mainly on software and IT deployment, integration with developer tools. Its best parts are its technical features. They didn't name the product Jira Software for nothing. Jira Core is essentially a slimmed-down version of Jira that is officially aimed at business teams, but unfortunately it lacks (at least in the Server version) critical features such as digital boards, which I will talk about a little later. Technical teams in a huge number of companies work happily and successfully with Jira - but software that has a reputation for being a development system is not normally something which the average Joe can also use to manage their day-to-day work tasks. When such a person starts working with Jira for the first time, they may be a little overwhelmed by the depth of the system's many features and functions. Nevertheless, we and many of our customers use Jira in many completely different teams and company departments. Jira is not limited to just our technical teams. You can clearly see the advantages that Jira brings to various teams when you focus on its ability to promote transparency, its visualizations that give you a clear overview, and how it inspires collaboration rather than just technical integration. Why should companies actively work to dig Jira out of its technical corner? What would help new users become enthusiastic about using Jira and get on board faster? Here are a few thoughts. In many organizations, agile project management processes and methods have long since spread far beyond software development. Kanban, Scrum methods, and mixed approaches from various methodologies are used in teams throughout organizations. Even traditional corporations are diving deep into agile concepts, driving transitions and working to scale their agile processes - for example with the Scaled Agile Framework (SAFe). But every modern agile team needs a good digital foundation; paper cards on a physical Kanban or Scrum board can't systematically map and track projects, tasks and processes, especially in today's distributed environment. 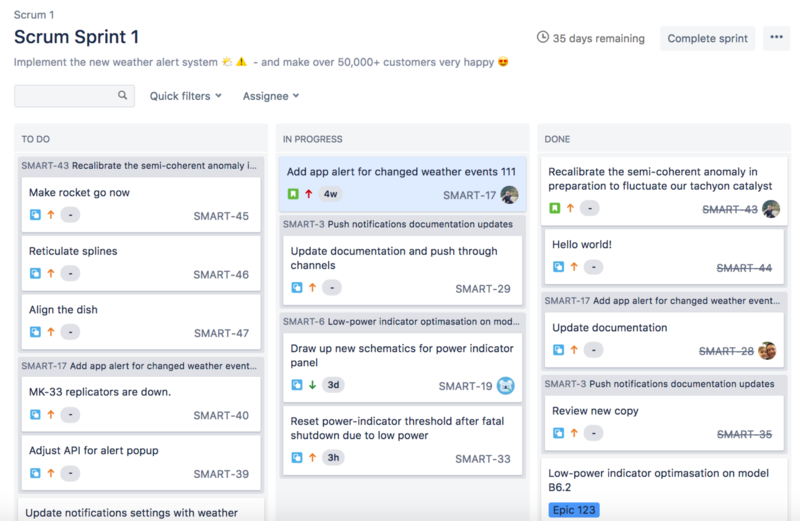 With its comprehensive, flexible visualization features, Jira supports all of this with the required digital foundation, including the teams' usual agile boards. You aren't trapped by rigid specifications when configuring such digital boards either. Classic Scrum? Kanban? Kanban with a backlog? Your own custom solution? No problem! On these boards, the issue 'cards' (with the main information about those issues) can be moved around with drag & drop. An issue's status is automatically and in real-time updated when you drag it from one status column to another. Optional work-in-progress limits for certain columns make workflows easier and avoid traffic jams where issues simply build up and build up. Optional Jira apps add additional levels such as portfolio management (Portfolio for Jira) and integration of SAFe into Jira with Agile Hive. For these reasons and more, product managers, Scrum Masters and Agile Coaches like using Jira, and as a result they effectively encourage more teams to use the tool. Whenever a team-lead presents a well-configured visual Jira board to their team, containing current tasks, their statuses -- which auto-updates when issue cards are moved -- and a defined workflow, they quickly catch the attention of every team member. Even if the team does not organize itself agilely, a top-down visualization reviewing its activities can help teams plan their tasks more effectively and efficiently. Unfortunately for many organizations, such a central overview often doesn't exist. Whether you're using agile or classic project methods, every business and every team needs to be able to transparently track the status of their tasks and projects. Jira is unrivalled in this respect. Each issue has a unique link, which takes you directly to the up-to-date information about the task. If a workflow is configured, inactive issues are regularly reopened and assignees notified. Visual overviews, automatically updated statuses and a large number of filters make finding out the current status of an issue quick and easy. From a higher-level Epic down to the individual tasks, and even if there are thousands of issues in the system, locating the ones you want is a breeze in Jira. You can view things from different perspectives, right up to the Portfolio level, and get quick answers to even the most specific questions. For example: Which open tasks are assigned to me? Which issues in the team project are not yet assigned? Which project tickets or sprints are open, in progress or completed? Which allocated times are used up? And so on and so forth. With powerful extensions such as Arsenale Dataplane, our evaluation options expand even further. When the company works with Jira, the system is not on a deserted island. Atlassian takes great care to integrate its solutions. One aspect of this integration - the interaction with Atlassian's development tools such as Bamboo and Bitbucket - is aimed at helping technical teams. The other aspect is valuable for all users in an organization, especially its integration with Confluence. The integration between Confluence and Jira runs deep. You can incorporate all kinds of Jira information, from simple task lists to dynamic ad-hoc reports into Confluence pages in just a few steps. This integration means fewer context changes for employees working in Confluence, you have more transparency when looking at issues and projects where you don't have to open Jira and click through a Jira project or board. When we use a systematic approach to integrating Jira content into Confluence, it can increase the number of employees who will Jira willingly: Finding up-to-date Jira data in the most central, important points of your wiki helps you learn how to use Jira, and develop the habit of using the software. Plus employees can easily create Jira issues from within Confluence; they don't have to leave their current work environment in order to do so. Jira integrates so well with Confluence that it makes us want to use Jira - we don't only sense this actively, but also passively. The second part of the article will continue with specific functions such as workflows, comments, mentions and notifications.